China’s economy is clearly under pressure and it shows, whether you look at the limp performance of the Renminbi, plunging Shanghai Composite, softening PMIs, or indeed, the weaker price action in commodities. The chart of the week comes from a report on the outlook for Copper (and China), where we focused on this particularly important commodity. 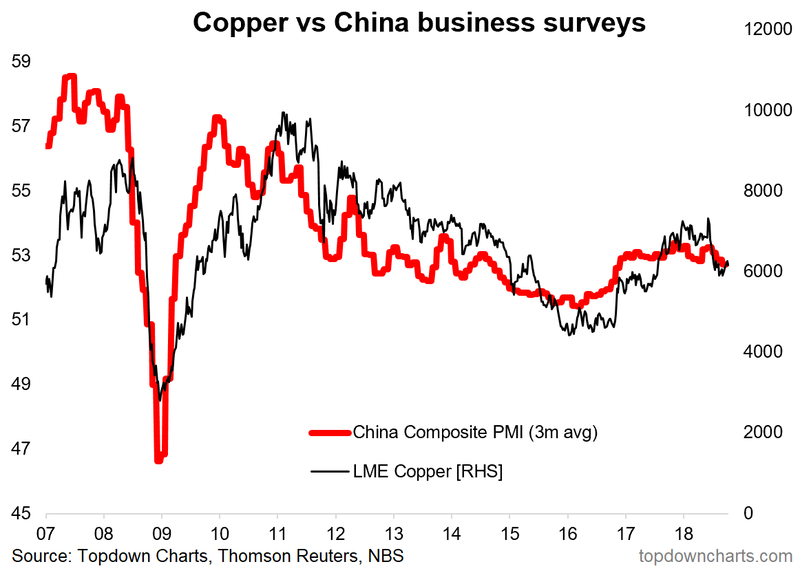 The chart shows the copper price against a smoothed composite of the Chinese purchasing managers’ surveys. Specifically, we’ve got LME spot copper prices on the right hand axis, and the 3-month smoothed average of the NBS manufacturing + non-manufacturing PMIs. Taking a smoothed, combined measure of the PMIs allows for a less noisy and purer signal on the macroeconomic currents in China. The first thing most people are probably thinking is “why should China matter for copper?” There are a few good reasons; firstly, China is the largest global consumer of copper, accounting for around half of global demand. The other thing is that China’s economic cycle is intimately affected by the Chinese property market (which also quite directly reflects policy settings). Thus, if China’s economy is softening, we should expect copper to face headwinds, all else equal. And if China is stimulating its economy, we should eventually see this flow through to stronger copper prices. Aside from the opportunities for trading copper that this presents, it also means that copper serves as a useful cross-check against the economic data pulse in China. Previous articleStocks and Bond Yields Testing Multi-Decade Resistance!